It goes without saying that I am obsessed with Pinterest. I love lurking around for a while (read: hours) and finding cool pictures to look at and projects to try. I like to keep myself busy crafting as often as possible because I find it to be very therapeutic, so when I go too long without creating anything, I enjoy finding simple DIY's that won't create crazy messes and will only take an hour or so to make.. It's fun to try what others are trying and figuring out what works for you. Saturday afternoon I had a decent chunk of time, so I decided to try out a pin I had seen a while ago. 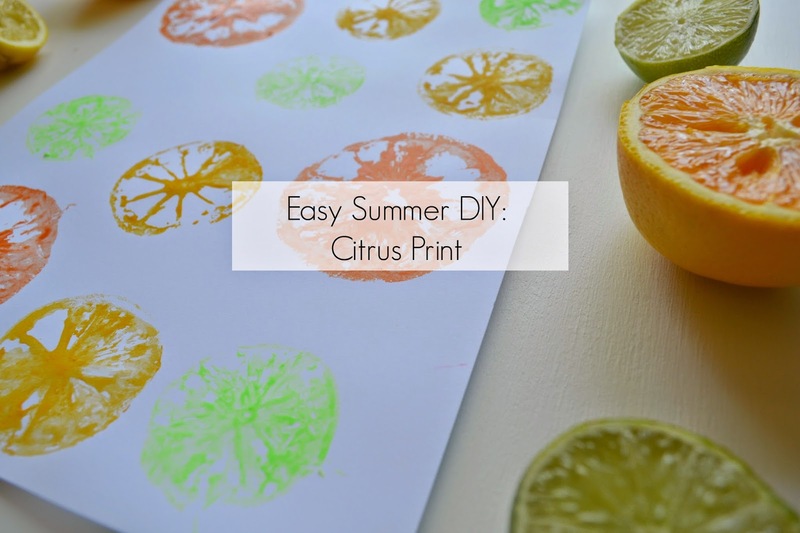 This citrus print DIY is so cute and perfect for Summer, and it's easy and (mostly) mess free! -an assortment of fruits and/or vegetables. Your choice, I went with all the citrus I had on hand! Before you begin printing your fruits on your paper, dab your fruits with a paper towel until they are mostly dried out. Lightly coat with paint. Press down your fruit on your paper for 3-5 seconds, and quickly remove. Tip: practice this a few times. My fruit was still too wet the first time, I put way too much paint on the second time, not enough the third time, you get the point. It does take a little practice. Repeat these steps alternating fruits and colors. You'll be left with an awesome summery print for your wall! Easy, right?? What easy and fun Pinterest projects have you pinned recently? this is such a great idea. I love it. It's cute. Yeah! I think if I used pinks and greens it would totally look more Lily Pulitzer like! Love it. 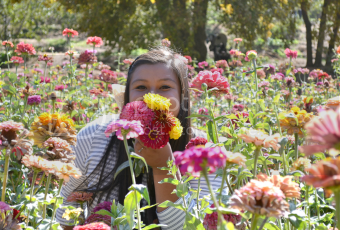 Such a great way to brighten things up. SO fun! I love little crafts that bring back memories! This is so smart! I am so going to get these now along with some paint this weekend! Wohoo! Hope you got to try it out! Awesome! And so fun for kids! Yes it's perfect for a toddler! Thanks Taneja! I am soooo obsessed with Pinterest too. These are so cute! I can't get enough of Pinterest either! What a fun idea! And it looks so cute! cute!! I am using lemons in a recipe tomorrow so we'll have to give this a go! Awesome! Hope you got to try it! I always think that crafts have to take forever, but you're right they can be quick and easy like this! I love it!! Cute project! Did you use a thicker paper? Hi Jessica! Sorry for the late response on this! I did use a little bit of a thicker paper. It's scrapbook paper so fairly thick! i'm right there with you! i am obsessed with pinterest. you're so crafty!! i wish i could get some of my pending pinterest projects done. I love pinterest, but I am so not the crafts person! This does look easy enough, though! This is totally easy enough even if you aren't crafty! What a great idea! I'll have to do this with my kidos. Hope you get to try it out with them! That looks like fun. Love it! I am in love with this super simple DIY! I definitely want to do this with my daughter - I think she would love this. I'm sure she would! Hope you get to try it out! How adorable! These would look really cute in a hot pink frame. Thanks for sharing this easy diy. Ah! Good idea with the celery bunch! I'll have to try that next! I've been meaning to try this with my girl's! Yours turned out beautiful! Oh my gosh this is SO amazing! Pinned!